the woman sitting in front of us at the flick had a hairy-eared little dog, a salacious b. crumb, in an airport duffel in the seat beside her. when joe was in the bathroom, i leaned forward: "does he see a lot of theatre with you?" "to the ballet, to all kinds of shows, oh, he comes everywhere with me," she said. was he a papillon? 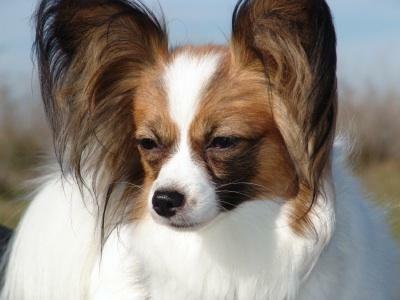 "papillons are the second-smartest dogs; poodles are the smartest. when i heard i was going to get a service dog i expected something big, i had always had huskies, they sent me ace here and i thought, what am i going to do with this little thing?" he had been trained to alert her to the presence of kiwi; she was deathly, anaphylactically allergic, and she'd had a heart attack, so she couldn't handle epinephrine in the event of a kiwi sneak. ace had signaled at a salad of hers in a restaurant, a salad that hadn't had kiwi at all, and she asked the kitchen to look again, to be sure that he wasn't registering false positives. kiwi juice in the dressing! she told me he wanted to say hello—guide dogs for, say, the blind aren't supposed to interact with strangers, but some medical alert dogs can—and i offered him the back of my hand. we call steve salacious b. crumb because he has that high-pitched, mildly malevolent trill; ace was just a gentle licker, his little eyes bright under the house lights, down and up for the end of intermission. Why oh why does this make my heart feel so much? @LPC because a pocket-sized, butterfly-eared dog who glares at fruit to protect his mistress is the sweetest thing ever? i wrote a magazine article a month or so ago about medical alert dogs and spent a long time on the phone with a veterinarian at a working dog center who was telling me about the robot noses they're trying to develop to better detect ovarian cancer, and i wanted to tell this woman at the flick about it, but really i just wanted to fawn over ace, as she was so clearly used to people glaring at her for carrying him around. unrelated: that was not the flick's original cast! i think i read afterward that they switched over at the beginning of september. this cast was also good, but damn, i hope you and P saw the first one. matthew maher is one of my favorite stage actors.